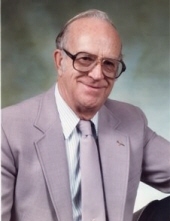 Roger Lee Plymale age 97 of Pikeville, Kentucky passed away Sunday, March 24, 2019 at the Pikeville Medical Center. He was a merchant and a minister. He was a member of the Kimper Church of God since 1949 and had pastored 8 different churches. He was a veteran of World War II serving in the United States Army. Roger was born at Simers, Kentucky on March 10, 1922 the son of the late Miles and Pinkie Smith Plymale. Along with his parents, he was preceded in death by his wife, Dorotha Fletcher Plymale on November 12, 2011 and also by ten brothers, and sisters. He is survived by two sons, Gary (Debbie) Plymale of Kimper, Ky. and Gene (Sandy) Plymale of Pikeville, Ky. and one daughter, Mozel (Roscoe) Justice of Rogersville, TN. He is also survived by one sister, Ezell Smith of Huddy, Ky. and one brother, Ralph Plymale Jr. of Freeburn, Ky. and eight grandchildren, eight great-grandchildren and two great-great-grandchildren. To send flowers or a remembrance gift to the family of Roger Lee Plymale, please visit our Tribute Store. With Rick Hisle and Robert Coleman officiating. "Email Address" would like to share the life celebration of Roger Lee Plymale. Click on the "link" to go to share a favorite memory or leave a condolence message for the family.